When it comes to affordable, family oriented sailboats no builder in the world matches Catalina Yacht’s numbers. Since production of the first Catalina 22 in 1970, the company has more than 68,000 boats to its credit. When you consider these mind boggling numbers and Catalina reports that more than 40% of Catalina owners are on at least their third Catalina sailboat, it does’t take a genius to figure out they’re doing something right. Catalina’s designs target the family cruiser, and when there’s an opening in this market they can be certain to provide a product to fit the need. 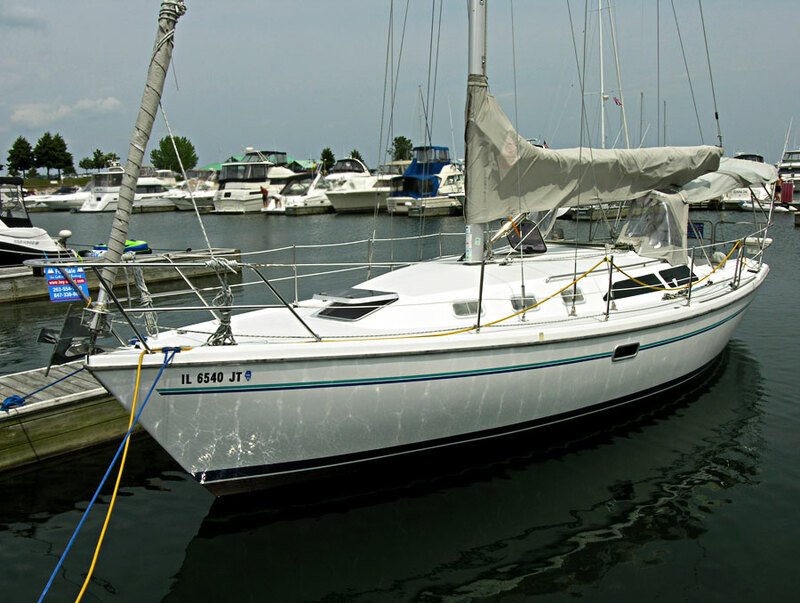 The Catalina 34 was first introduced in 1986 to fill the market gap between Catalina’s 30’ and 36’ models. Between 1986 and 1995 the design remained pretty much unchanged except for the incorporation of a transom swim platform in 1990 and newer models. The length is 34’ 6" overall, 29’ 10" at the waterline, and the beam is 11’ 9". The standard draft is 5’ 7", although a shoal draft option is offered. When first introduced, the shoal draft model drew 4’ 8". In 1987 a wing keel model was introduced with an even greater reduction in draft to 4’ 3". Displacement of the standard draft model is 11,950 lbs. and 12,550 lbs. for the shoal draft model. Between 1986 and 1995 over 1,300 Catalina 34s were built. In 1996, Catalina introduced the Catalina 34 MkII. This newly styled model is reported to have exactly the same principal dimensions as the earlier model and, from the side, is very similar in appearance to the earlier model. In fact, the deck and hull mold were modified considerably, and the width at the transom increased by more than 2’. The new design provides a much more roomy cockpit and larger boarding area. Getting a handle on just how the Catalina 34 is built is a bit difficult. The hull is single piece fiberglass construction with no core materials, and the deck utilizes a balsa core. The hull and deck are joined in a shoe box fashion and fastened with a flexible adhesive and stainless steel screws. Like many of today’s production boat builders, Catalina makes considerable use of modular fiberglass liners and structural grids. These make it difficult, if not impossible, to thoroughly inspect structural components of the vessel. According to Catalina’s literature, the 34 is built with "an engineered stub sole structural system with stainless steel tie rods, a molded structural hull liner, and a stainless steel truss". Having never visited the factory or taken a boat apart, I must admit I’m not quite sure what this means. I can say that older Catalina 34s have held up well to the uses and abuses they experience sailing in and around the Chesapeake Bay. Accommodations have always been a strong selling point for all Catalina models, and the 34 is no different. Most Catalina 34 owners have something good to say about the roominess of the interior. The layout features a V-berth cabin forward followed by the main saloon with starboard side dinette and port side settee. The galley is aft along the starboard side, and there is a good sized head along the port side next to the companionway. The master cabin is aft along the starboard side and features an athwartship double berth tucked below the cockpit. On the negative side, the galley has very little working counter space and there is no decent sea berth. Auxiliary power on most Catalina 34s was provided by a 23 hp Universal M-25 diesel engine although the 30 hp M-35 was fitted in some boats, and some of the new models are now coming equipped with Yanmar engines. The smaller engine option should provide enough power for most situations, although some owners have chosen to install three blade propellers in order to improve motoring performance. My personal opinion is that three blade props can’t make up in motoring efficiency what they cost in increased drag and loss of performance under sail. If you plan to motor more than sail, and performance under power is more important, it would be better to look for a model with the larger engine and stick with the two blade prop. My experience has been that the 34 sails well on all points of sail and has posted respectable results on the race course when sailing to her handicap, although most Catalina 34 sailors I have spoken with prefer the standard keel to the wing model for all around performance. Like many of the Catalina models, the 34 was offered with standard or tall rig sail plan of 528 or 554 square feet of sail area respectively. This seems to be a rather small difference, but it results in an increase of the sail area to displacement ratio of nearly a full point--15.6 to 16.4. For light air conditions the extra sail should be welcome. Owners seem to be about evenly divided into three camps: Those that prefer the tall rig, those that prefer the standard rig, and those that don’t feel there is much difference. If I have any particular fault with the 34’s sailing characteristics, it’s that weather helm is a little more than desired when the wind picks up. With more than 1400 boats on the water, Catalina 34s are quite common on the used boat market. I can’t recall any Catalina owner ever feeling that he or she didn’t get good value for his money, and that’s a tough record to improve upon. If your plans call for extended cruising, the Catalina 34 is a bit short on storage space, and I think the rigging and construction may be a little light for extended offshore passages. However, for the sailor looking for a comfortable, affordable boat with coastal cruising, weekending and daysailing in mind, the Catalina 34 would be an excellent choice.